Replace chimney flashing or not. We have an approximately 1,000 sf ranch style home with what i believe is a hip roof and a 2x2 chimney IN the roof (if you will) for the boiler furnace and hot water tank exhaust. I’m beginning the tear down myself tomorrow and I’m thinking I’d sure like to reuse the original flashing on the chimney instead of dealing with all the unfamiliar territory of new flashing. I have a carpenter buddy who’d probably come out for a day and do it or I’m not afraid of doing some research but why fix it if it ain’t broke and i could use the time working on something else on my money pit haha. Thank you for your input. Wish me luck. Re: Replace chimney flashing or not. Also, i have an attic fan and I’m guessing the previous homeowner added this for improving cooling in the attic space since there is a whole house air conditioner air handler in the attic. I suppose it wouldn’t hurt to leave it with the new roof? 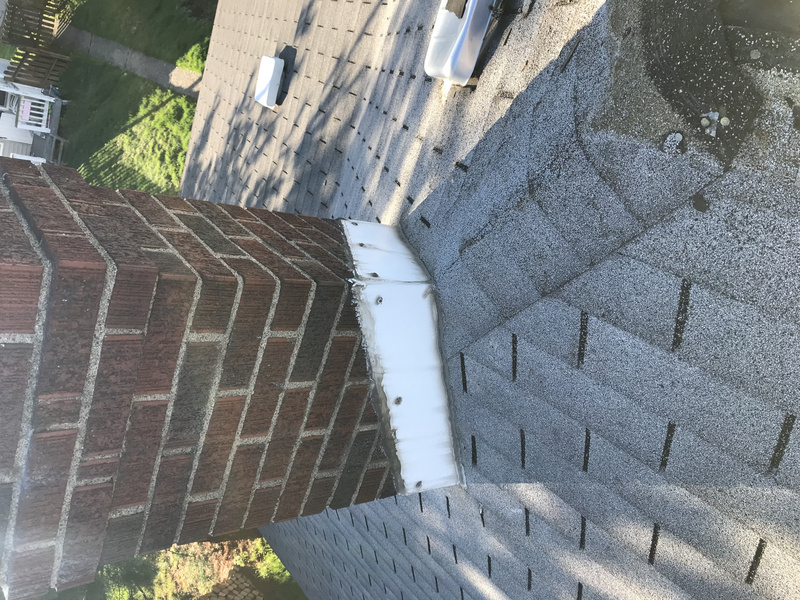 Regarding chimney flashing, If the counter flashing is still in good condition and fastened well to the chimney, it is often left in place and re-used. The step flashing under your shingles would all be replaced. Flashings should be replaced too. What you have now is probably galvi steel and galvanization do wear off. Also you could reuse the flashings only if they match the steps of the shingles. If you're using architectural shingles, example, old flashing may be inadequate and out of position. Architectural shingles also last longer which means you want longer lasting flashing. So after seeing your photo, your counter flash is installed wrong, so I would want it done properly by cutting into the chimney so the upper counter step would seat, and be sealed directly into the chimney bricks. They way it is now you are 100% dependent on roof tar to seal the flashing against the chimney. Gotcha. Thank you! I wonder if there’s flashing underneath the current fake “step flashing”. If so, maybe i could reuse that. Also, how to determine whether i can reuse the valley flashing? I’ll rent or borrow a break but just looking for options. The cost of new flashing is such a small cost of a roofing project, that it doesn't make sense to try and save it. By the time you have it removed it will be bent up and full of holes. I never use metal in the valleys, only ice & water underlay, then overlap it thru the valley with the flank underlayment courses. 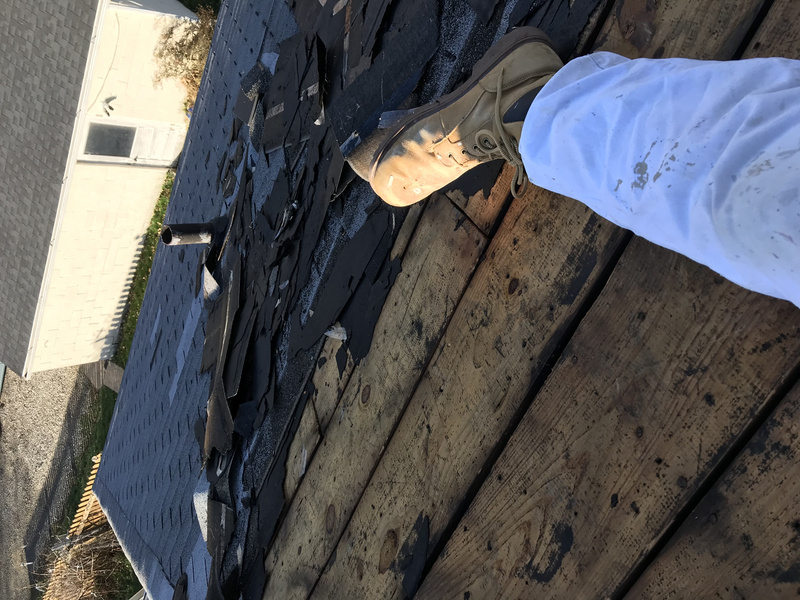 Well i tore down one plane of my roof, replaced some wood under the drip edge, and layed the synthetic roofing paper from 8:00am to 10 pm today. It’s a 7/12 pitch and it was a bit tricky keeping a good grip. I’m lucky i didn’t fall. I guess my painters reflexes kept me going. The wood repair made it a much longer day than i had anticipated and there’s a storm forecasted for tomorrow. There were many loose nails in the 1x12’s used for sheathing. I’m wondering if a pro would remove them and replace with larger nails. Also there were a few broken boards producing holes which i didn’t have time to repair so i plan to support them maybe somehow from underneath in the attic. The job would have gone more smoothly if tomorrow’s weather forecast weren’t soft rain. I’ll have to plan my next jaunt a little better. When I reroofes boards with loose nails I reshoot every board. If you nail near the old nail, it tightens up the old nail as well. Quick with a gun, you should be OK just pulling and renailing them in a new hole. I never reuse valley metal, which is very common here. Almost every roof in my area uses open metal valleys, they work great on snowy climates. If your going with open valleys and they are common where you live, the suppliers will have prebent valley metal. Probably 8' sections in steel, I would recomend that route. Hip chimneys aren't so simple to reflash, if your Buddy knows what he's doing I would recommend you go that route. Last edited by PatChap; 04-14-2019 at 06:31 AM. I should reshoot another larger nail in the same hole right? Otherwise too many nails tend to split the old dry wood. The west side of the house has a metal valley and the southern side is weaved I’m guessing there was a tree where the flashing is because leaves won’t tend to stick in the metal valley. Ok now I’m wondering how long can i leave the roof with just underlayment. I’m torn between shingling the plane i tore down or tear down another plane.